Coventry subcontractor Philip James produced the front steering knuckles for the new, £135,000, limited edition Jaguar XKR-S GT, five-litre, V8 coupe. The parts were produced on the company’s line of six Hurco 3-axis machining centres that are more usually used to machine prototype suspension, chassis and steering components for Jaguar, Range Rover and Land Rover, including the new L550, nicknamed Baby Discovery. Volumes range from ones and twos up to 50-off. Knuckles in particular require intensive milling. They start as a solid round aluminium billet that is typically reduced from 94 kg to less than 6 kg when the part is fully machined. For subsequent volume production, the components are produced from aluminium forgings – unless it is for a small run of cars like the XKR-S GT. Philip Whitehouse, managing director of Philip James, said: “One of the front knuckles for JLR was proving problematic to machine. 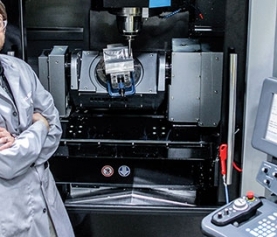 “While most of the milling and drilling could be carried out on one of our 3-axis Hurcos, the component then had to be transferred to a CNC jig borer for five holes to be interpolated at three different angles – and therefore in three set-ups. Apart from decreasing the cycle time, the new 5-axis process eliminates the need to use a tooling hole for component alignment prior to boring. One-hit machining on the Hurco also allows Philip James to swap between producing the two hands more quickly. This is important, as JLR often cannot wait for a full batch of, say, 20 left-hand and the same number of right-hand knuckles to be delivered in one consignment. The new Hurco machine is the first 5-axis machining centre at Philip James, and Mr Whitehouse asked the manufacturer to modify the machine so that the B-axis head can be tilted past horizontal to allow cutter access for all JLR knuckle bores to be interpolated in one hit. The required negative angle was -8 degrees. Hurco engineers removed the limit switch on the head, allowing it to tilt up to -20 degrees. So other features like undercut faces can also be machined without repositioning the part on an angle plate, again saving time and improving accuracy. The modification means that the head guarding comes close to the table and especially near to a laser tool measuring device. To avoid any chance of collision, the subcontractor used Work NC computer aided manufacturing (CAM) software from Sescoi to program the machining cycle and check for interference. 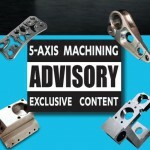 Although the knuckle application requires 3+2 axis machining, the VMX42SR is capable of full 5-axis cycles. Mr Whitehouse is hopeful that it will attract additional work from the aerospace and motorsport sectors and also pointed out that it will reduce the need to use expensive form cutters. 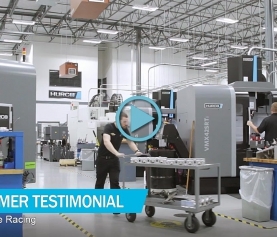 To find out more about this 5-Axis machining center, click this link.